Today’s fans expect more than a quality, entertaining product on the field; they also expect a quality experience surrounding the game itself. With mobile and digital platforms playing a stronger role in how teams appease and interact with their fan bases, certain technologies have become a staple of every game day experience. Strong, secure Wi-Fi for fan use is now one of these staples. In addition to keeping fans connected and supporting their day-to-day mobile behaviors, Wi-Fi allows teams to better enable their strategic digital initiatives. The NFL’s Tampa Bay Buccaneers recognized the importance of offering Wi-Fi to their fans in-stadium. As such, the Buccaneers teamed up with Extreme Networks to design and deploy a custom Wi-Fi solution for Raymond James Stadium, the team’s home field in Tampa Bay, Florida. The system not only offers public-facing Wi-Fi for Buccaneers’ home games and in-stadium events, but it would also support vital operational assets and digital marketing initiatives. Already considered the #1 Stadium in the NFL for in-venue technology, the Buccaneers now have a powerful business asset to meet the demands of their fan base and their organization. 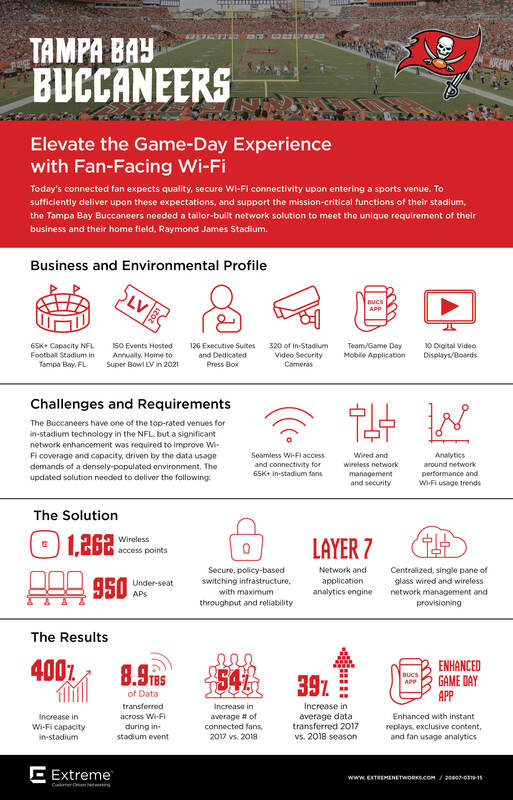 Learn more about Bucs’ challenges, the in-stadium networking solution, and the results the deployment drove by checking out the infographic below. If you would like to learn more about Extreme Networks, our NFL relationships, or our networking solutions for Sports & Public Venues, check out the additional assets below.